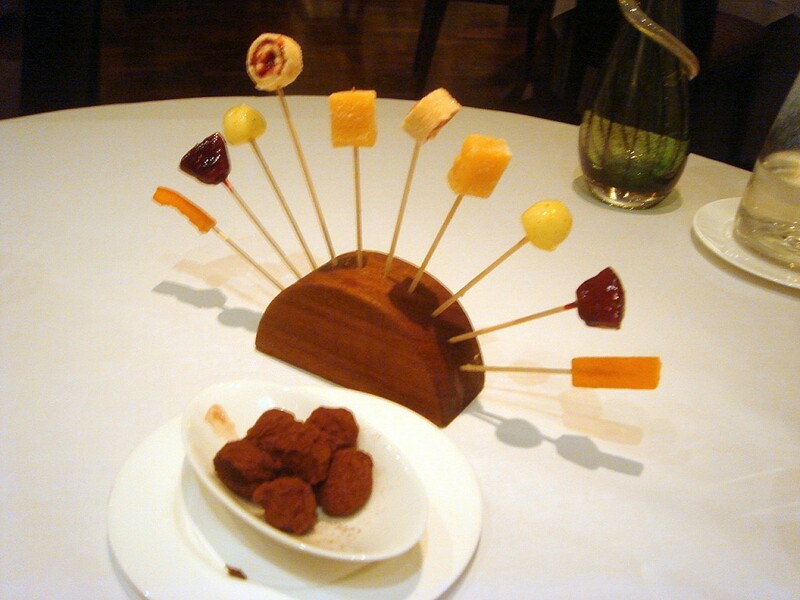 My choice was The Square, a two star Michelin restaurant. It’s been many years since I have been, and I was craving something with great finesse. The chef and co-owner is Philip Howard, who after spending a summer cooking in the Dordogne region in France, went on to work under Albert Roux OBE at the Roux Restaurants group for a year. This was followed by another year long stint with Marco Pierre White at Harvey’s, a restaurant that was situated where Chez Bruz now is, and then a similar amount of time under Simon Hopkinson at Bibendum. The Square has won many awards along the way since it opened in 1991, and arguably Philip Howard, who is known for his elegant, classical French cooking is one of the best chefs in the UK today. 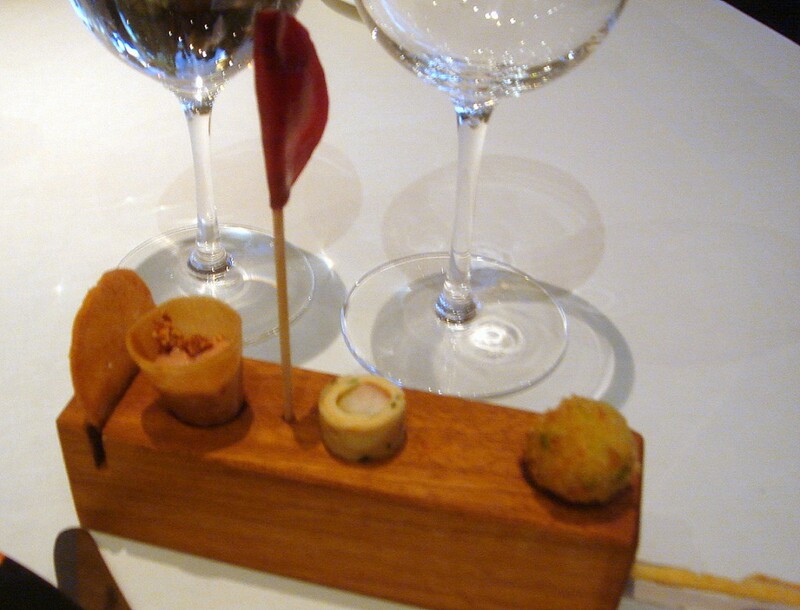 The tasting menu (£95) it was to be, for a girl has to eat after all, especially on her birthday. To start was a selection of canapés which included an anchovy crisp, risotto beignet, smoked eel with cucumber, beetroot crisp with goat’s cheese, foie gras cornetto and parmesan crisp. All delivered on taste, but the cornetto wowed with its intensely reduced flavour of liver. To the amuse bouche, which was a thinly sliced avocado with a sweet pepper vinaigrette, gazpacho jelly shot and sour cream ice cream. This was fresh, summery, and pleasant on the palate. The gazpacho shot, encased in the jelly, provided a lovely kick to the dish with its mild spiciness, although I found the jelly quite thick and therefore too gelatinous. It almost added an unnecessary weight to the lightness of the dish. The avocado was slightly drowned out by the gazpacho, but otherwise, this dish was pleasant. 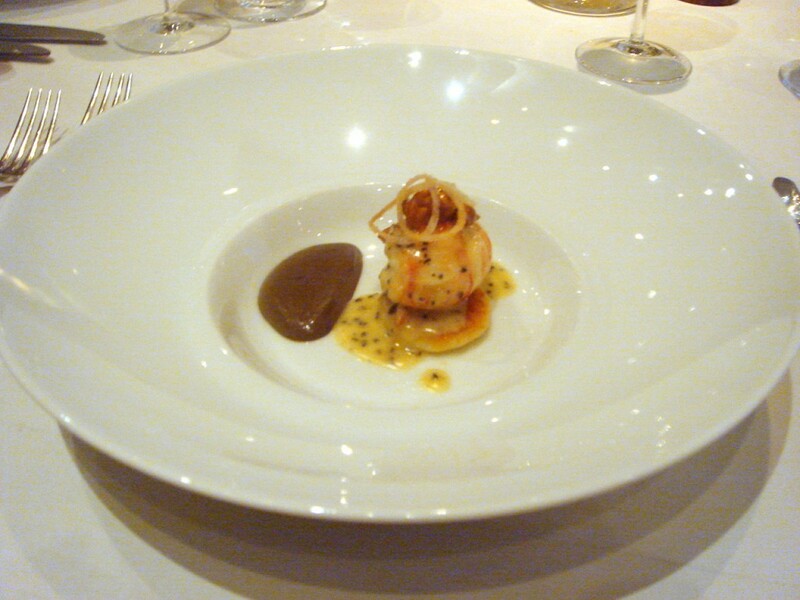 Sautéed langoustine tail with parmesan gnocchi and an emulsion of potato and truffle was next. The langoustine was superb, meaty and firm, and the emulsion, with its creamy, velvety smooth tones, adding greatly to the langoustine. 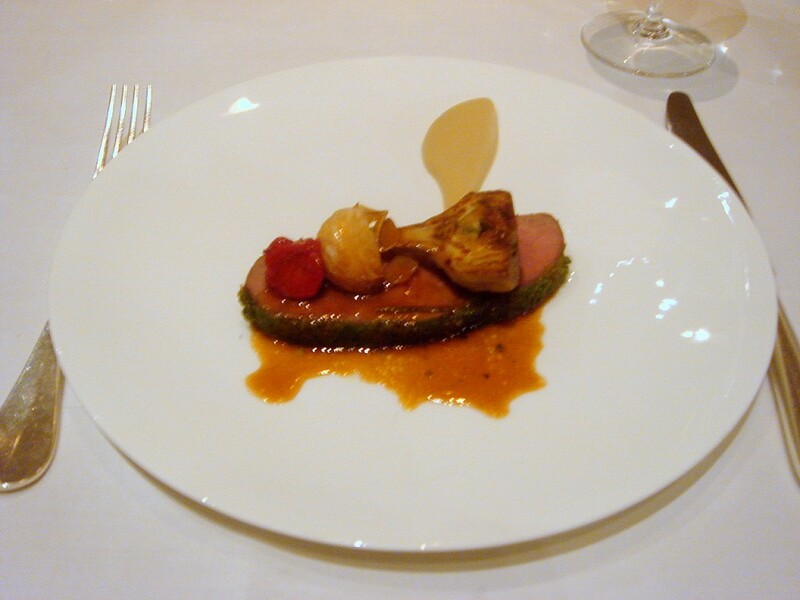 Accompanying this dish was a mushroom puree which had been expertly reduced to deliver an exquisite texture and flavour. This was a wonderful dish, cooked to the highest order, although disappointingly, it was difficult to detect the truffle (which I assume was truffle oil) in the potato. 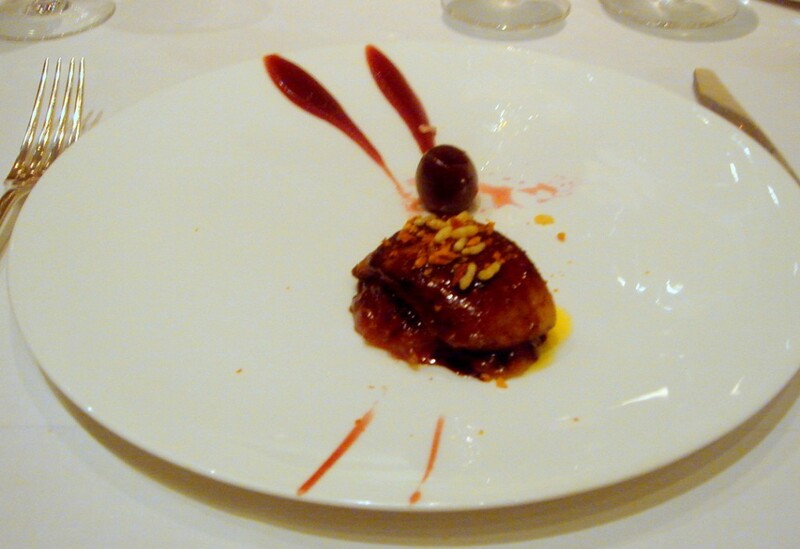 A faultless roast foie gras with a sweet and sour citrus glaze, slow cooked cherries and honeycomb delivered the perfect balance between savoury, sweet, sour and citrus tones. The honeycomb added a delicate, subtle crunch to the dish and the foie gras was luscious and firm. This was yet another excellent dish. 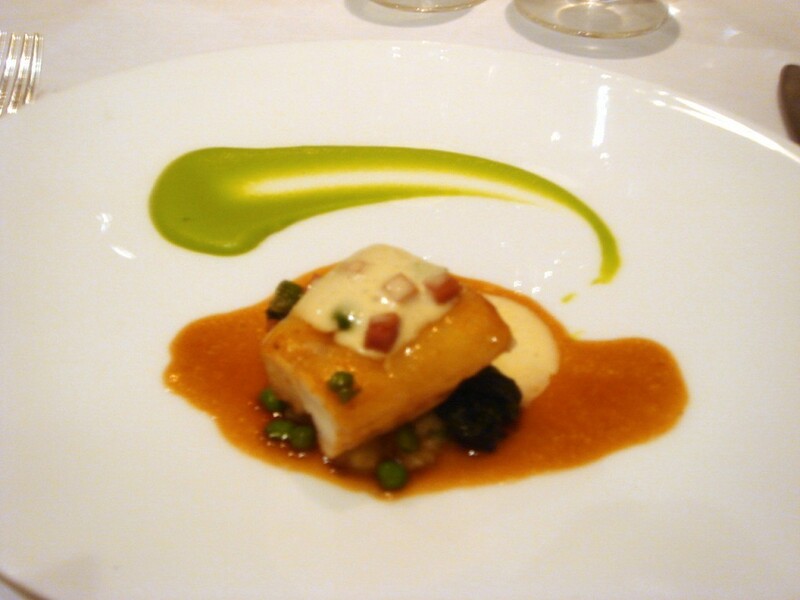 Loin of monkfish with a puree of peas, and glazed lettuce was decadently cooked in lardo di collonata, fat from the neck of a pig. The monkfish was moist and meaty, with a richness coming through from the pig’s fat without leaving it tasting fatty. The puree of peas with its highly concentrated flavour accentuated the dish with its freshness, although I found this dish to be heavy on the seasoning. The meat dish was a herb (thyme, rosemary and garlic) crusted saddle of West Country lamb with shallot puree, garlic, balsamic vinegar and olive oil. The lamb yielded a subtle tender flavour, but did not have the gamey meatiness that I prefer. Oddly, it was more tender in certain parts than in others. The shallot puree was excellent and highly concentrated, and the garlic sauce was not overpowering, although I again found this dish to be heavily seasoned. A cheese plate of Barkham blue cheese was pleasant. 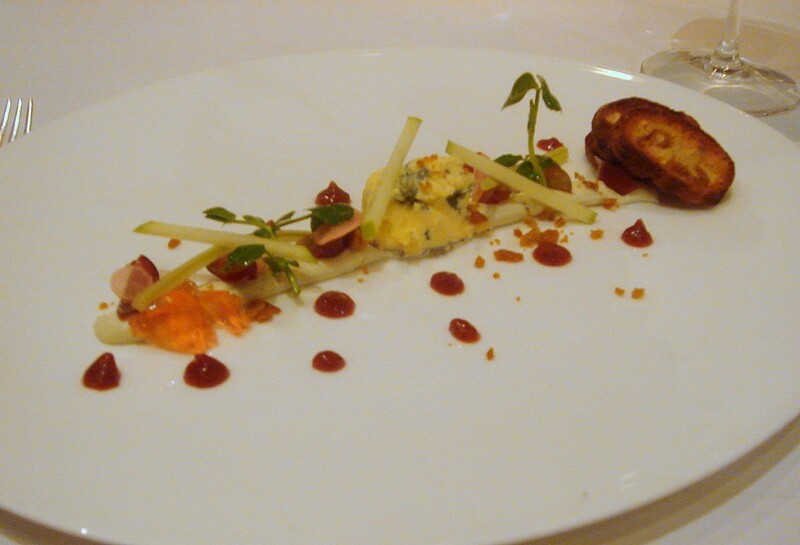 It was not overwhelmingly blue, and the apple and celery helped to cut the richness of the cheese quite nicely. 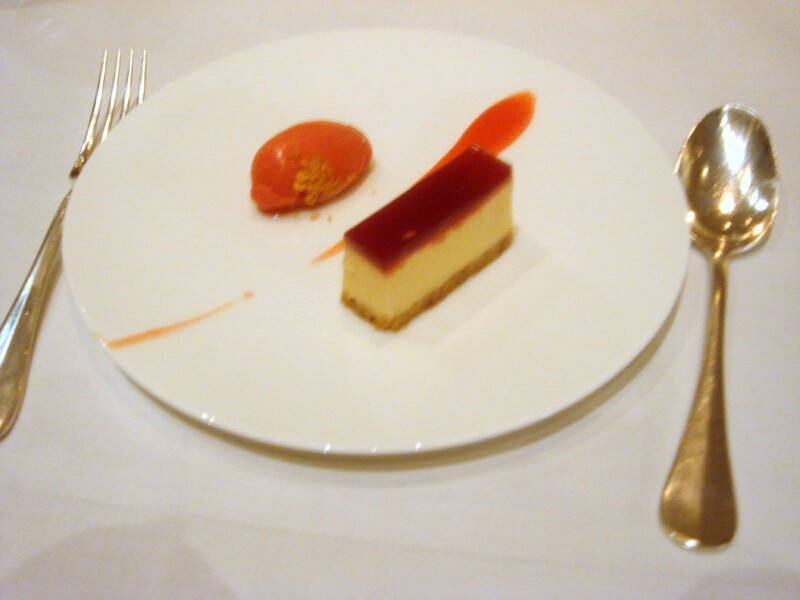 Pre-dessert was a Brillat-Savarin cheesecake with Kentish strawberries and strawberry tea sorbet. The cheesecake was luscious and creamy, probably in no small part due to the cheese being used. However I found the sorbet a touch too tart. Dessert was a mocha soufflé which delivered a perfect balance between lightness, eggyness and flavour, and it was arguable one of the most perfectly cooked soufflés that I have ever eaten. It was served with dulche de leche ice cream, which on its own was fine, but in combination with the soufflé was perhaps a little too sweet. 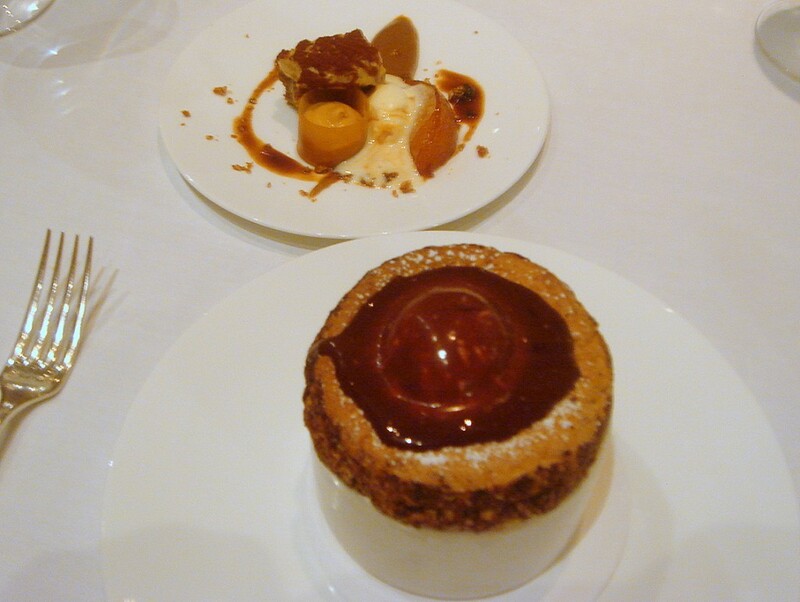 There was also a small side dessert of tiramisu, roasted pear and dulce de leche ice cream. This was nice, but unremarkable. Disappointingly, when this dish was presented, the ice cream which came with the tiramisu was almost half melted, a faux pas that in my opinion should not have occurred at a restaurant of this level. Petits fours included a selection of orange peel, pineapple with hibiscus jelly, fruit roly-poly and orange Turkish delight. All were pleasant, although the Turkish Delight was so tart that it was a bit difficult to eat. There were also salted caramel chocolates. As to the service, you know it is flawless when you hardly notice the presence of the waiting staff, but somehow your cutlery is constantly replaced and your water glass continually filled. And such was the case this evening. As a further sign of the calibre of the service, before the meal started the waiter checked whether we would prefer to finish our champagne first, or to start the dinner immediately, a classy and thoughtful gesture that I have not seen elsewhere before. The room is a statement in boldness with its wood panelled walls. The tables are spaciously placed and make for comfortable seating. But the lighting was slightly peculiar as it was dimmed in such a way that it caused the room to look grey. It was obvious that the restaurant was struggling with the lighting for it was adjusted several times throughout the evening, and noticeably so, which I found quite irksome. That aside, the meal was excellent overall. The dishes were sophisticated, cleverly constructed, and balanced, and the flawless execution delivered strong and intense flavours that simultaneously did not overwhelm the palate. There were a few minor niggles, but this was classic French at its best. Really was fun to catch up and hopefully you’ll enjoy the chocolates. I loved eating dinner at The Square. 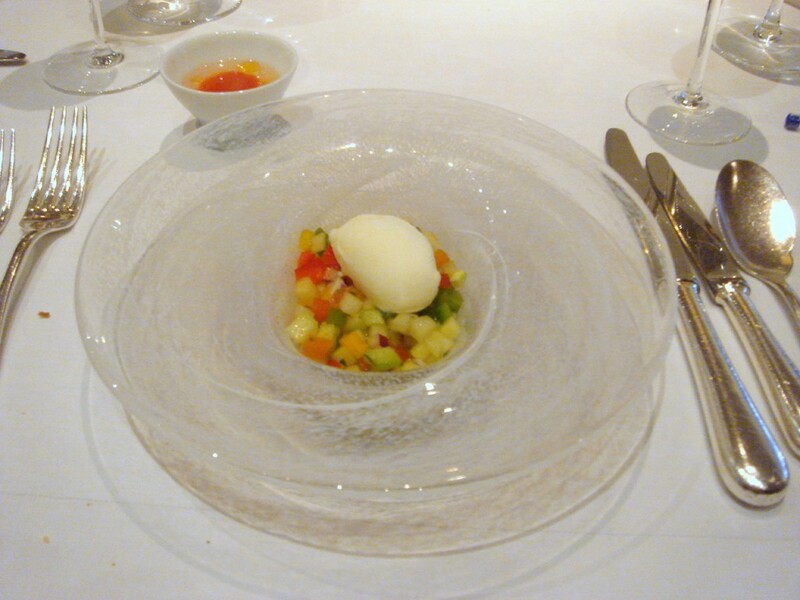 Chef prepared one of the best vegetarian tasting meals I had in London, better than his Michelin 3 star competitors. Tony and G, thanks for the b’day wishes. Annie, good to hear that you love The Square. It really is a worthwhile 2 star. Happy birthday! What a great meal to celebrate! I wish I had eaten here when I was in London, maybe next time 🙂 We’re off to a summer vacation that includes another mobil 5-star up in Maine, really excited about it! Lovely write-up. I’ve got a reservation at The Square in a few weeks time, I’m looking forward to it! the only problem I have with the Square (and really its not a problem in actual sense) is that the portions are rather generous, especially when the elements on the plate are very rich. I had the tasting menu (plus an extra course) and was struggling even before I had got anywhere near the extra course (which was a second main course). A belated Happy Birthday. Sorry I haven’t been able to comment more because I’ve been working all hours and only had limited access to the internet, but I’ve read all your posts for the past few months and I’m really impressed with everything you’ve achieved. Anyone who can visit a 2* restaurant as a student chef and criticise it constructively has my vote. I seem to recall doing exactly that myself at Mugaritz last year. Maybe we can meet up to eat when I’m in London over the Christmas period. Wishing you all the best. Hi Trig, thanks for the birthday wishes. Yes, let’s meet up in December if we can arrange it. Drop me a line. And I’m really glad you like my blog. I’m not sure if it will be December or early January, but one way or the other we will definitely go out and eat. When do you finish at college? And have you eaten with Nuno Mendes yet? I’m sure I can arrange for Nuno to cook for us.